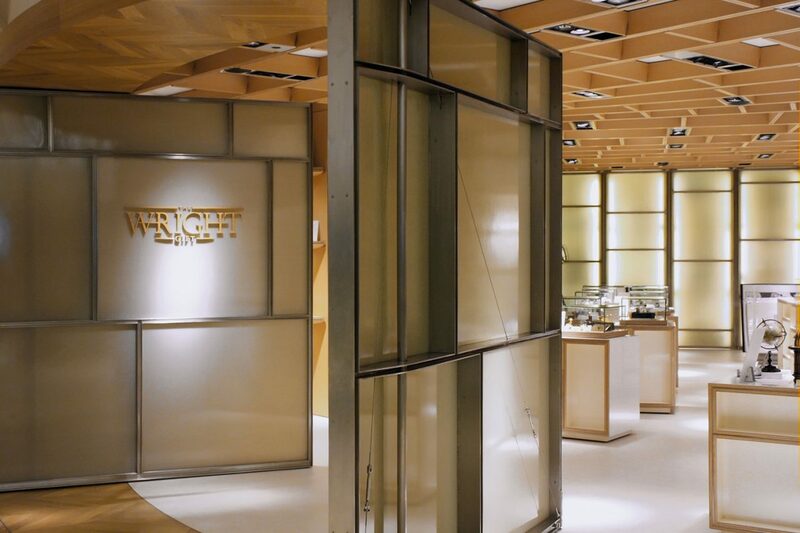 The term ‘Deep Envelope’ describes two retail interiors (for The Wright Gift) —one situated on the uppermost level of the ION Orchard shopping center, and one located at The Shoppes at Marina Bay Sands. 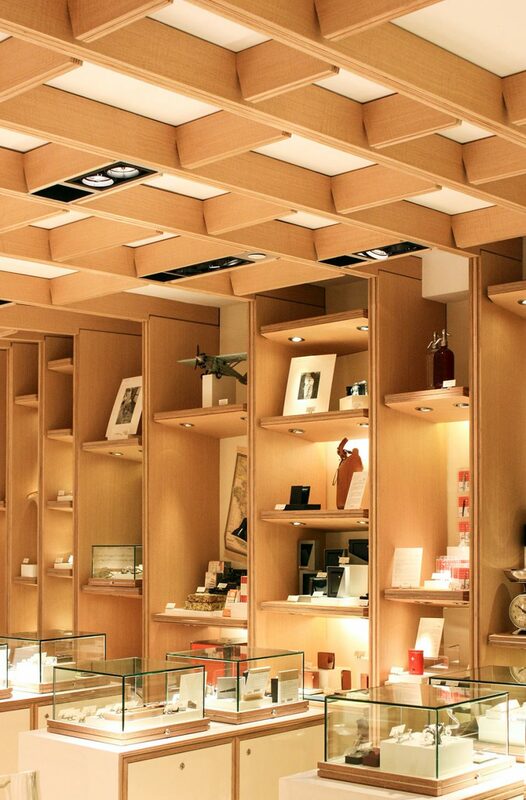 The design language for both locations is predicated on the production of a flexible architectural screen and storage device that can organize a massive quantity of retail goods (gift items), while amplifying the codes of retail design. The intention was to minimize distraction and heighten the visual focus on each item held within the screen. The screen operates as a sectional wrapper, merging wall and ceiling into a continuous surface and pattern, albeit one that is calibrated for various demands. At the wall, the screen creates deep pockets—window displays of sorts that highlight the items in the collection. 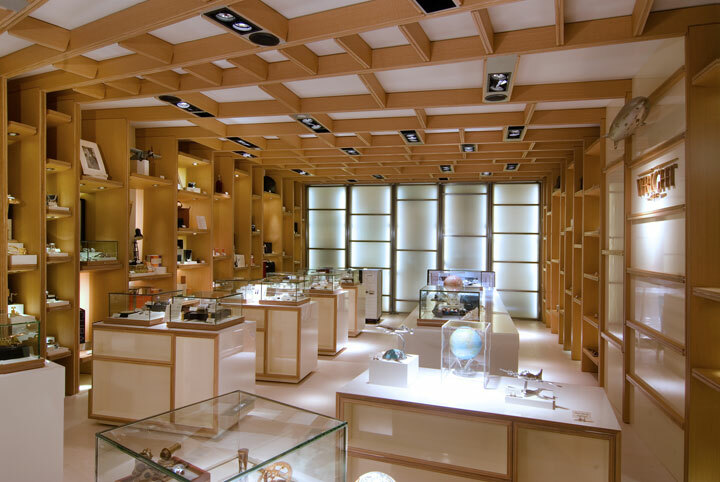 At the ceiling, shallow pockets organize areas for lighting, air conditioning, speakers, and sprinklers. The depth of the wall surface is used as a device for obscuring and frustrating visual access to the collection. The idea is that by creating an experience where one must walk through the space to view each item, desire will be amplified. This interference is purposeful; it intensifies the presence of the architecture in a carefully controlled relationship between architecture, display, and object. The interiors are compositions of anigre veneer, architectural-grade plywood, ivory lacquer panels, and stainless steel. 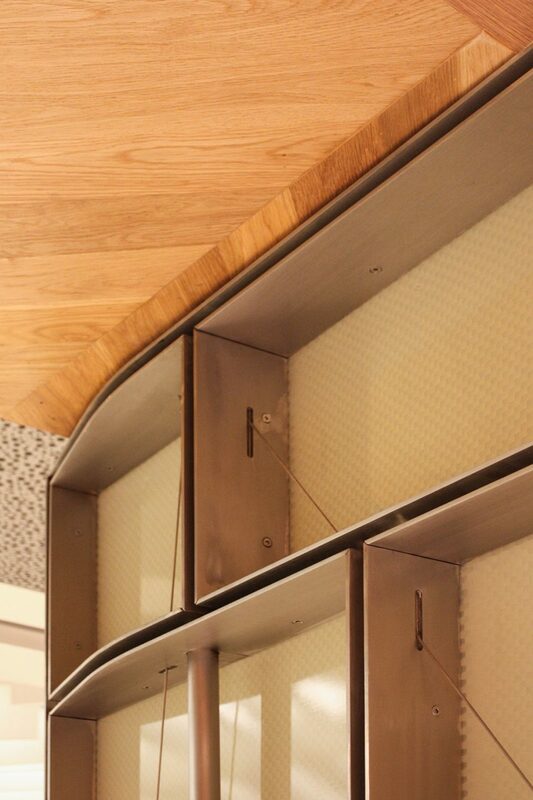 The materials’ subtle tones contrast purposefully with the retail items. 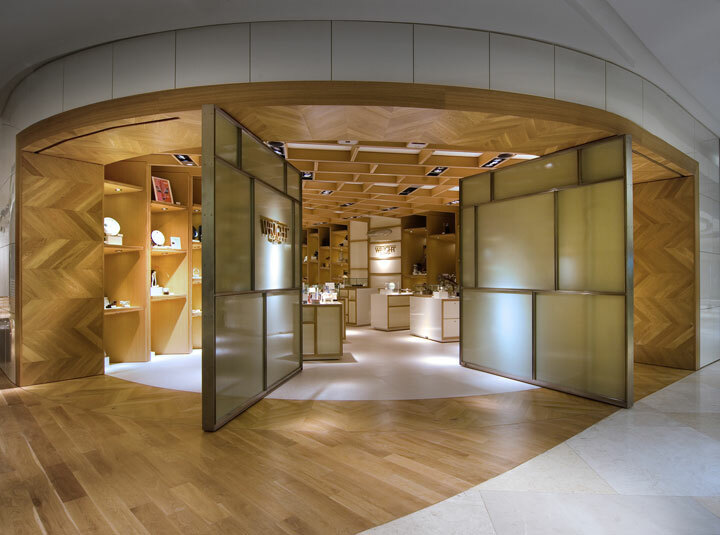 A custom herringbone American oak threshold surrounding the storefront mediates the existing timber material and pattern of the public corridor, creating a surface of continuity while framing the anigre wrapper. 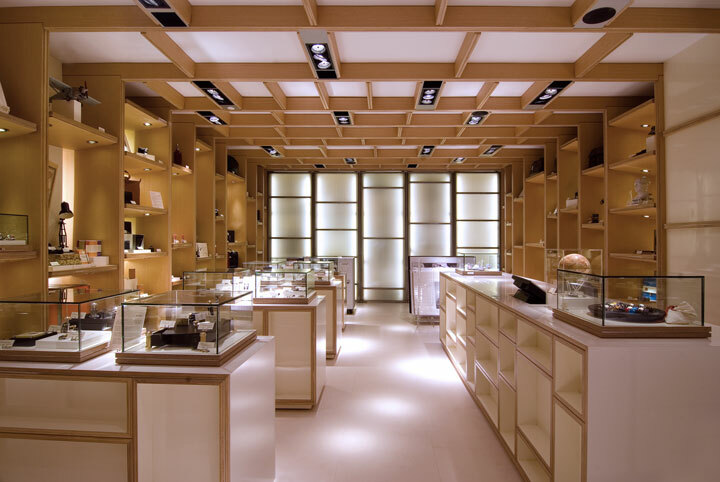 LEDs, halogen downlights, and metal-halide fixtures impart a dramatic and ambient illumination, heightening the quality and uniqueness of each gift and the space itself. The architectural system accommodates various site configurations. At The Shoppes at Marina Bay Sands, the long rectilinear deployment tapers in section, creating a long funnel. This exaggerates the perceived length of the space, amplifying one’s impression of the collection’s size. Likewise, at ION Orchard, the architectural system bends along a twisted plan. Compressed around the turning point, the close proximity of vertical elements creates a sweeping and twisting effect. 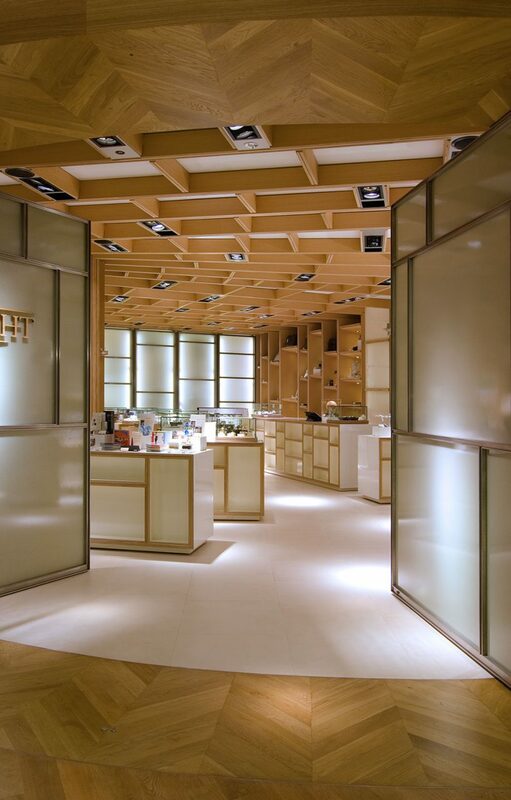 The curved plan of the retail space is highlighted by two massive center-pivoting doors. Constructed with machined stainless steel and translucent Panelite, each door performs as a planar funnel to direct views and circulation. Likewise, five highly crafted self-illuminated Panelite doors at the rear of the store camouflage storage while providing a dramatic interior facade within the store proper.